What movie did Kiyoshi Kurosawa also direct? Send your answer, along with your address details, to comp@starburstmagazine.com labelled BEFORE WE VANISH before midnight on Sunday,February 17th. The film follows Narumi, whose husband Shinji becomes one of the three hosts. As the invasion grows nearer, Narumi’s attempts to save humanity from extinction become increasingly entwined with Shinji’s decision on whether to save the humanity within himself. 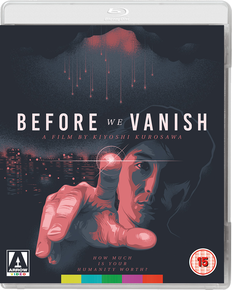 UK Release date On Blu-ray and Digital HD 11 February 2019. Also premiering on Arrow Video Channel on Amazon Prime Video UK 11th February 2019.